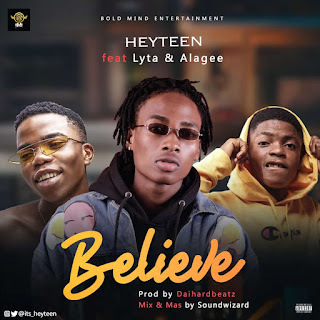 Super talented singer, HEYTEEN drops is much anticipated hit single titled "Believe" featuring YBNL sensation, Lyta and the ORO crooner, Alagee. "Believe" by Heyteen is a motivational jam which is set to put you on a positive side all through the year. Believe by Heyteen was produced by super duper producer, DAIHARDBEATZ. So sit back and enjoy "Believe" by Heyteen as he takes you on a ride.